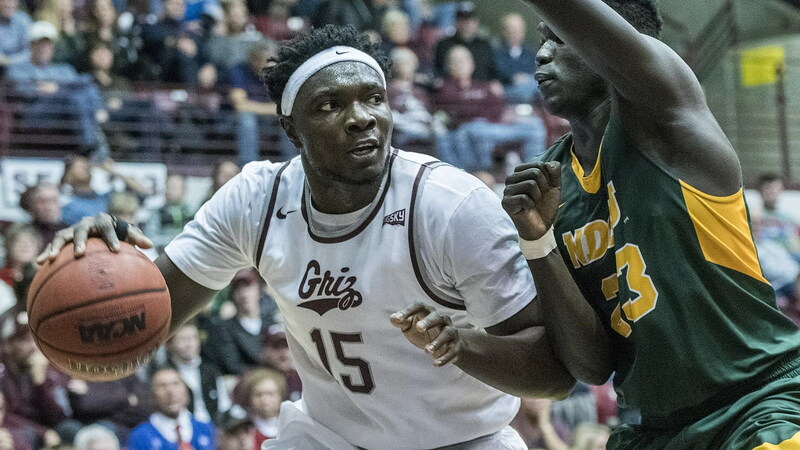 Good teams find ways to win, and that’s what the Montana Grizzlies did on Monday night, defeating North Dakota State, 60-53, inside Dahlberg Arena. The win guaranteed Montana a winning non-conference record for the second season in a row, and just the sixth time in the past two decades. The Grizzlies (6-3) led for more than 27 minutes against the Bison (4-8), but found themselves trailing at the half after scoring just 19 points. That changed early in the second period when Montana scored on three consecutive possessions, totaling eight points in just 72 seconds, to regain the lead, 29-27. The 8-0 run extended to 22-5 as Montana opened up a double-digit lead over the visitors. The Grizzlies held the lead for the remainder of the game, shooting nearly 60 percent from the floor in the second half. A big reason for the second-half success was Montana’s ability to hit from deep. The Grizzlies went 1-for-8 from three-point range in the first half before making five of their first six attempts in the second. Montana scored just 21 points through the first 23 minutes of action before scoring 22 points over the next 6 minutes. Montana went 7-of-8 from the floor during that stretch, knocking down five treys, in addition to blocking a pair of shots and holding NDSU to 2-of-9 shooting with four turnovers. Playing for the second consecutive game, Jamar Akoh scored a team-high 17 points, in addition to a team-most eight rebounds and three assists. Bobby Moorehead was also clutch, scoring 13 points, including three three-pointers – two during Montana’s second-half run. With two games remaining, Montana is guaranteed a winning non-conference record for just the sixth time since the turn of the century. The other five times it has happened, Montana has advanced to the NCAA tournament on four occasions and the CBI once. Montana turned the ball over a season-low seven times, compared to 14 for NDSU. The Grizzlies scored 18 points off of turnovers, compared to just three for the Bison. Montana led for the final 15:27 of the contests, including by as many as 11 points. Akoh played a season-high 34 minutes. In three games this season, the senior is averaging 15.0 points and 8.0 rebounds per game. Akoh scored 10 points in the first half, and 12 of Montana’s first 21 points overall. Moorehead had his best shooting night of the season, going 4-of-7 overall and 3-of-6 from deep. One of his misses was a near-half-court heave as the shot-clock was expiring. He has now scored in double figures in three of the past five games. While Montana has played a deeper lineup this season, just six players played more than 8 minutes on Monday. Montana’s 19 first-half points were its fewest since Jan. 24, 2015. On that night, the Grizzlies also overcame a 23-19 halftime deficit to beat Southern Utah, 58-56. The Grizzlies held the Bison to just six points through the first 10 minutes. The Bison were 3-of-12 shooting with three turnovers to begin the game. Michael Oguine’s three-pointer with 2:23 remaining extended his streak of consecutive games scored in to 62. Montana’s 19-game home winning streak is the fourth-longest active streak in all of NCAA Division-I basketball. Montana improved to 5-0 all-time vs. NDSU in Missoula.